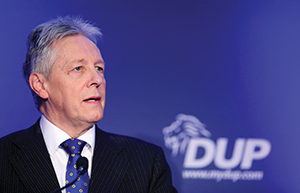 Addressing the DUP party conference as party leader for the last time, Peter Robinson told party delegates that Northern Ireland was on the motorway to a better future. November was a busy month for the DUP, fresh from agreeing the ‘Fresh Start’ deal the party held its annual conference at the La Mon hotel in Newtownards. On the eve of the two day conference, party leader and Northern Ireland’s First Minister, Peter Robinson announced his intention to retire. This decision brings an end a career in politics and the DUP that lasted over 44 years. Addressing the conference, Robinson told his party colleagues that he had intended to leave a year ago but his timetable and the political process did not quit run in sync. However, he has since announced his resignation as DUP leader, with effect from early January. He will be replaced by Arlene Foster. Looking back over the past 12 months Robinson reflected on a period of great electoral success for the party that saw it retain its position as Northern Ireland’s largest party and increase its vote share. There was also a large amount of praise for the DUP’s newest MP, Gavin Robinson, who took the East Belfast seat back from the Alliance Party’s Naomi Long. There was however a moment of condolence for William McCrea who lost his seat to the UUP’s Danny Kinahan. The general election itself was touched on by Robinson. At one point many commentators felt the DUP may hold the balance of power in any coalition government, this did not come to pass as the Conservatives surprisingly took a majority of 12 seats. However, Robinson feels that this small majority will not see the government through a full term and will present his party with the opportunity to play a vital role at some point during this parliamentary cycle. “We may not yet hold the balance of power at Westminster but make no mistake, in the coming months and years of this parliament, our influence and our pivotal role will grow and grow,” he said. “As we said during the election, ‘more votes, more seats, more for Northern Ireland.’ I can assure you, when that day comes, we will use our influence wisely. Claiming that the fundamental block on politics in Northern Ireland for the past three years was the failure of some to accept welfare cuts, Robinson said this deal removes the obstacles to progress and provides the “most generous arrangements in the UK to protect the most vulnerable.” The First Minister also told his party colleagues that the deal will mean more can be spent on public services like health and education and help over 100,000 Northern Ireland families who will be affected by the change to tax credits.